No showings until Premier Open 2/9 from 11-1pm. 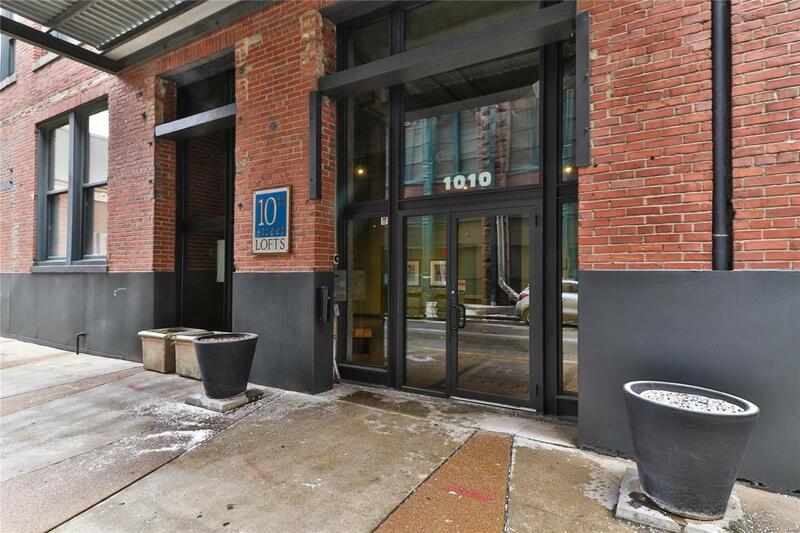 Welcome to 1010 St. Charles St. right in the heart of Downtown St. Louis! Find everything you love about Loft living - exposed brick, 12ft ceilings, open ductwork and oversized windows. Travel on original maple floors into the wide open floor plan, perfect for entertaining. The Kitchen, fully equipped with stainless appliances, cabinet storage, and breakfast bar, overlooks the open Dining area with modern light fixtures. Cozy up with a movie on the 130 inch projection TV in the Living Room. Enter through historic double doors into the spacious Master Suite with dual walk-in closets and luxurious bath with vessel sink, separate jet tub, and oversized shower. Just down the hall youll find a full bath and additional bedroom with walk-in closet. Both bedrooms have access to private, screened-in porch. Complete with in-unit washer & dryer and attached garage parking (#504). Just minutes from restaurants, entertainment, and transportation!